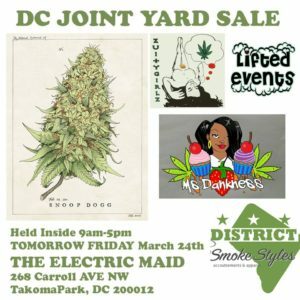 Tommorow’s DC Joint Yard Sale is on my mind! 9a-5p inside The Electric Maid 268 Carrol Ave, NW Washington DC – Gonna be some awesome vendors with awesome things tomorrow! — with Rico Valderrama, Gisèle-Audrey Mills Phd, Renee James,Blackluv Hawkins, BudLyfe Exclusives, Koko Slim,Enoughis Enough, PHONE HOMIE, Rose Glow Tea Room and District Smoke Styles.